The online registration site is open since 2 August 2017. In an unprecedented initiative of breaking financial barriers to accessing a top-tier event, this year’s edition of PIMRC is offering in a festive and sharing spirit the most affordable and inclusive registration fees ever posted by a flagship conference in the field. It has also negotiated and secured unbeatable room rates at its top hotel venue. For similar quality events, both registration fees and room rates are usually up to 40-50% higher! IEEE PIMRC 2017 is pleased to announce the sixteen tutorials scheduled within the technical program of the conference. They cover a wide range of timely and disruptive topics and will be presented by top-notch experts in their field, both from academia and industry. PIMRC has always been living up to its promise and reputation of being one of the premier conferences in the wireless research arena and of standing as one of IEEE ComSoc’s flagship events. 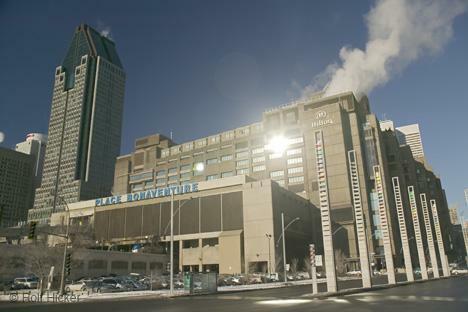 The creation of Place Bonaventure involved much more than just the construction of a building. Above all, it is the story of people who, over several decades, devoted their energy to fulfilling a concept of monumental proportions. Between the Laurentians and the Appalachians, the St. Lawrence Plain is punctuated by a series of hills extending from east to west. These Monteregian Hills, as they are known, were formed by intrusions of molten magma over 100 million years ago. One of them, Mount Royal, dominates the largest island of the Montreal archipelago, right in the heart of Quebec’s biggest city. “The Organizing Committee of IEEE PIMRC 2017 has been working with the IEEE 5G Initiative – within the framework of the IEEE International 5G Summit series – on holding and organizing a 5G Summit edition in Montreal ; and is today proud to annonce its co-location with the 28th edition of PIMRC. The National Education Fair was one of the first events related to education and career choice in Quebec. It is the only event in Canada to combine a comprehensive offer to answer specific needs of the next generation as well as of the working force, as a result of a shift taken by INEO more than 10 years ago by presenting in conjunction with the Fair, The National Job Fair and, more recently, The Study & Stay Abroad Fair. Montreal has been ranked as the WORLD’S BEST STUDENT CITY in a new ranking out from QS, becoming the first city to take Paris’s first-place slot since inaugural ranking. Ranking is based on university rankings, affordability, student mix, desirability, and employer activity. With more than 100 festivals and public events, the city of Montreal has its own international reputation when it comes to festive atmosphere and joie de vivvre. Multiple exciting sociocultural events are to held in overlap with PIMRC2017. From fashion to culinary events, Montreal has all the ingredients of perfect mix between technology and culture. The deadline for submissions to the Workshops and Special-Sessions of IEEE PIMRC 2017 is now extended to this Friday 4 August 2017 at 23:59 EDT. This extension is final and firm! Many of you have recently requested extra time to finalize their manuscripts. Hopefully, this extension will allow prospective authors finalize and submit their contributions before the new deadline’s expiration. Thank you! IEEE PIMRC 2017 solicits submissions for live demonstrations of research results intended to provide interested researchers from both academia and industry with the opportunity to showcase their experimental work before IEEE PIMRC 2017 attendees. IEEE PIMRC 2017 solicits the submission of special session papers within the technical scope of the conference. The proposed special sessions listed below offer a unique opportunity for in-depth discussions where researchers and industry entities are invited to share their state-of-the-art research and development results on specific areas and novel challenging topics. IEEE PIMRC 2017 solicits the submission of workshop papers within the technical scope of the conference. The proposed workshops listed below offer a unique opportunity for in-depth discussions where researchers and industry entities are invited to share their state-of-the-art research and development results on specific areas and novel challenging topics. IEEE PIMRC 2017 solicits proposals for tutorials within the technical scope of the conference. Tutorials are an opportunity for researchers from both academia and industry to learn about the state-of-the-art research. Proposals should concisely describe the motivation, the content and the structure of the tutorial. They should cover emerging topics consistent with the goals of IEEE PIMRC and provide clear and focused teaching material within the scope of the conference. IEEE PIMRC 2017 solicits proposals for workshops within the technical scope of the conference. Workshops offer a unique opportunity for in-depth discussions where researchers and industry entities are invited to share their state-of-the-art research and development results on specific areas and novel challenging topics. LAST CALL FOR REGULAR PAPER SUBMISSIONS! The extended deadline for submissions to the regular tracks of IEEE PIMRC 2017 expires today Monday 12 June 2017 at 23:59 EDT. Please note that this extension is final and firm! We strongly encourage, however, registration of prospective paper submissions on EDAS before then, should we be able to grant a short grace period allowing only manuscript (re-)uploads of previously registered papers. As no other new extension will be granted please. Furthermore, please note that we have added a new note both on EDAS paper registration webpages and on the conference website to further help authors avoid manuscript upload issues. Thank you and good luck! The deadline for submissions to the regular tracks of IEEE PIMRC 2017 is now extended to Monday 12 June 2017 at 23:59 EDT. This extension is final and firm! It is a celebration-year edition of PIMRC! And it already promises to be a memorable event based on the high number of submissions received so far. Guided by the very same sprit of widening participation circles to this top-tier conference, by setting as one example the most affordable registration fees ever for a flagship event, we have recently made all necessary new logistical arrangements to make it possible for more delegates to join the big party we expect to have! Indeed, a lot of you have once again requested extra time to finalize their manuscripts. Besides, many of you are still facing manuscript upload issues due to PDF format constraints or embedded font problems. We kindly bring to your attention the new notes recently made available both on the conference website and EDAS’ paper registration webpage; that is to help you quickly resolve these issues but also to address recent inquiries on what it means if you check your manuscript as a “student paper”. Hopefully, this second and final extension will once again properly address all reported concerns and most importantly allow new prospective authors finalize and submit their contributions before this hard deadline’s expiration. Thank you! The 28th Annual IEEE International Symposium on Personal, Indoor and Mobile Radio Communications (PIMRC 2017) will feature a comprehensive technical and industry program covering the latest research and innovation in wireless communications technologies. The deadline for submissions to the regular tracks of IEEE PIMRC 2017 is now extended to Friday 2 June 2017 at 23:59 EDT. Many of you have recently requested extra time to finalize their manuscripts or reported manuscript upload issues due to PDF format constraints or embedded font problems. We have just posted new instructions to avoid having these issues arise again. Besides, many of you will be travelling and attending IEEE ICC next week. Hopefully, this extension will properly address all reported concerns and allow prospective authors finalize and submit their contributions before the new deadline’s expiration. Thank you! We are receiving several inquiries on whether the May 19 deadline will be extended. We will definitely do our best to accommodate prospective authors as much as we can within the conference’s ability assessed right before the deadline’s expiration. We strongly encourage, however, registration of prospective paper submissions on EDAS before then, should we be obliged to limit our extension, if any, to simple manuscript (re-)uploads of previously registered papers only. Thank you for your kind understanding. When autumn settles over Montréal, the city changes in perfect harmony with nature. Responding to the ever-shortening days, Montréal brings the poetry of light into its neighbourhoods. In 2017, 50 years will have passed since Expo 67 and Montrealers of all origins have kept cherished memories of the event alive. Hundreds of thousands of them spent whole days exploring the dream city of Man and His World on “invented islands”, in the words of singer Stéphane Venne. MONTRÉAL COMES ALIVE! THE 375TH ANNIVERSARY OF MONTRÉAL’S FOUNDING! Montréal is a city that loves to celebrate and, in 2017, the island will be more festive than ever, with activities and surprises around every corner. From east to west, from the mighty St. Lawrence River to the top of Mount Royal,Montréal will be bubbling with activities and celebrations, which will be organized around four major themes. The foundation for PIMRC was a 1989 workshop on Mobile Communications organized by Prof Aghvami of King’s College London with the cooperation of the local IEEE Communication Society Chapter.